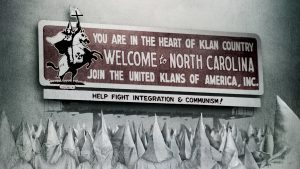 Connecticut Public Television > Inside CPTV > American Experience – Klansville, U.S.A.
American Experience – Klansville, U.S.A. Following the American Civil War, decommissioned Confederate soldiers in Pulaski, Tennessee, established the Ku Klux Klan in 1865 as a fraternal social club. The group quickly became violent, and had already begun to dissolve in 1871 under pressure from the federal government. In 1915, D.W. Griffith’s The Birth of a Nation romanticized the Klan. The enormous popularity of the film sparked a Klan revival in the 1920s, and by 1925, four million Americans claimed membership. But bad press and power struggles tore the group apart again in the 1930s. On CPTV: Tuesday, August 29 at 8 p.m.